FILE - Thai soldiers guard an area to prevent an anti-coup demonstration at Victory Monument in Bangkok, Thailand. Up to 50 million eligible Thai voters are set to decide the future of the country’s latest draft constitution, seen as crucial to the military government’s ‘roadmap’ to fresh general elections. But the outcome remains shrouded in uncertainty as surveys – while indicating support – also find 60 percent of voters ‘undecided’ ahead of the August 7 ballot. The military, in power since 2014, has kept a tight hold over debate on the draft, arresting dozens of ‘no’ campaigners, often students, together with raids on some media offices. Allegations have arisen that the new charter would see cuts in public health services – all denied by the government. In recent weeks, the military cleared the way for discussion of the charter on a state funded television station, Thai Public Broadcasting Service (TPBS). Gothom Arya, a former election commission member and university lecturer, says people have insufficient information about the charter given the limited debate and the arrests of those campaigning for a ‘no’ vote. “You can say that they threaten the people who try to campaign. What kind of freedom of expression when you cannot say ‘No’ and you cannot campaign for your opinion,” Arya told VOA. FILE - Thailand's Prime Minister Prayuth Chan-ocha arrives at a weekly Cabinet meeting at Government House in Bangkok, Thailand, May 16, 2016. The arrests of at least 86 'no' campaigners has led the United Nations' expert on freedom of opinion and expression, David Kaye, to condemn the moves, saying the government should allow “rigorous debate” on the constitution. The military has used laws supporting the referendum to criminalize the 'no' campaigners with fines and imprisonment of up to 10 years. The draft charter, if passed, would strengthen the influence by the military in the next parliament. Proposed tighter controls over the election of politicians in a 500 member House of Representatives and a 250 member appointed senate – including key military leaders – over a five year transition period – have all raised criticisms. A joint sitting of both houses would elect the new prime minister and not the largest party in the House. Kraisak Choonhavan, a member of the Democrat Party and former senator, says the tough stance taken by the military may trigger a public backlash. “Increasingly, this method of repressing freedom of debate from the beginning and only allowing limited debate on television – limited to three to four people only – to talk about the draft constitution at all, will bring about a backlash against the regime and that people will eventually be turned off ever from participating at all in fact,” Kraisak told VOA. “How can you vote ‘yes’ or ‘no’ when you don’t know what you’re voting for in a sense that nobody knows the content of this draft constitution?” he said. The Democrat Party, Thailand’s oldest party, rejected supporting the draft charter. Party leader Abhisit Vejjajiva said the new constitution would not end to the political conflicts that have affected the country during the past decade as the people would have little role to play in the country's administration. FILE - Former Thai Prime Minister Abhisit Vejjajiva attends a news conference at the Japan National Press Club in Tokyo. The Pheu Thai Party, backed by deposed former Prime Minister Thaksin Shinawatra and his family, also has called on voters to reject the draft. Thaksin’s sister, Yingluck Shinawatra, stepped down as prime minister shortly before the military's 2014 coup. Samarn Lertwongrath, a senior figure in the Pheu Thai Party, says party surveys point to a close outcome on August 7, and he says he is suspicious of the military. “The referendum according to our polls is very close. So I think to predict the result with our very cunning military men like this, they can cheat everything. So we wait and see, what can we do? 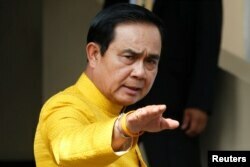 [But] it’s very close,” Samarn told VOA. Thailand has faced years of political conflict and protests largely between the rural and working class supporters of Thaksin, and the urban middle class and other elites, including the Democrat Party. Panitan Wattanayagorn, a political scientist and adviser to the government, believes the public is supportive of the constitution, and cautious after years of political turbulence. “The mood of the general public, excluding some keen political activists and other observers, has shifted from the very important document to something like stability, continuity, progress and certainly elections, most people are expecting next year, there should be a general election and return of parliamentary democracy,” Panitan said. Analysts say the military desires to remain influential in guiding the country through an anticipated royal succession, as revered Thai King Bhumipol Adulyadej is in poor health. Economist Supavud Saichaeu said this transition is reflected in the military’s aim to maintain influence in the next parliament. “There is a sense, if you really think about it, that the government is doing a lockdown of Thailand. That nothing is allowed to move, to change, to wiggle because of this twilight years,” Supavud said. Meechai Ruchupan, a veteran lawyer who chaired the constitution drafting committee, has called on voters to support the charter, warning of political turbulence if it is rejected. The military says if voters say ‘no’, they may press for elections using the existing interim constitution. Over 10,000 police officers will be deployed on the day of the referendum. The election commission has printed more than 54 million cards for registered voters to cast their ballot.